A few weeks ago, when my college friends decided it was high time we catch up, the biggest question that bothered us was ..WHERE? While the crowded atmosphere of pubs in Mumbai is quite overwhelming, lounge bars in Mumbai can be good option when you want to relax and have a good time. But the problem with Mumbai Bars is that you end up spending so much money on drinks that you hardly have money left to order real food. The answer to that was the street food stalls in Mumbai. Mumbai is a beautiful union of contradictions. It is a place where you find peace in the commotion, where you have sky scraping 5 star hotels on one end and poverty struck slumps on the other. So, me and my friends decided that we will first grab some drinks at the Aer Lounge in Worli and then head towards Elco market in Bandra for some street food pet puja. I call myself the most boring person on this planet. Why? A person who wears sarees to almost all occasions and refuses to drink alcohol. If that's not boring ..what is ? But what is interesting about me is my palate. I love gourmet as well as street food equally. And that is why this plan was perfect for me. Aer Lounge is one cool place to be at. The Four Seasons Hotel's premium rooftop lounge bar is class apart. Don't be surprised if you bump into the who's who of the glitterati at this place. The view from this place is mesmerizing...you see glimpses of the real Mumbai from here. While on one end you see the Haji Ali Dargah and skyscrapers of South Mumbai; on the other you see the Dharavi slumps. And since our tummies had already started growling, we decided to order some cheese quesadilla. 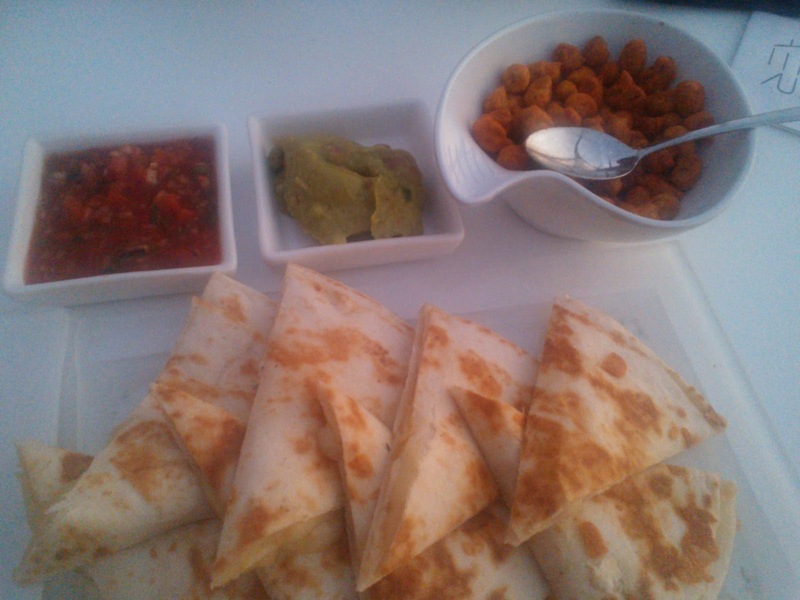 While the quesadilla was good, we seemed to like the complementary roasted spicy peanuts more. The ambience of this place was so chilled and relaxed that we didn't want to leave this place, but we had to, to conclude the second part of our plan. We reached Elco market in about 45 minutes and saw hoards of people gorging on yummy paani puris. We found ourselves a vendor and off we went on a paani puri marathon. After gulping down atleast a dozen paani puris, we decided it was time to stop. Even a small walk to the cab driver seemed like miles with our bursting tummies. This date with my friends was so much fun. Catching up with college friends after almost a decade, was the best thing we had done. We laughed we gossiped, we hogged and we had fun. When it was time to say goodbye, we all got emotional. We had relived so many beautiful moments for the last few hours. We were sad, we had to leave, but what made us feel better, was that we were hopeful for another reunion. Wow! I miss my friends even more after reading this post! Needless to say missing the street food .. My mouth was watering while reading your posts and seeing the pictures. You need to take me around in bombay while I am there next time. Looks like you all had a great time! I love Quasidellas!! I love Aer Lounge! Has an amazing view. And your mocktail looks delicious .. slurrrpp!!!! There's nothing like an evening gossiping with old friends...glad you had such a great time...and not drinking is not boring at all...infact it's braver than succumbing to peer pressure which is what a lot of kids do!